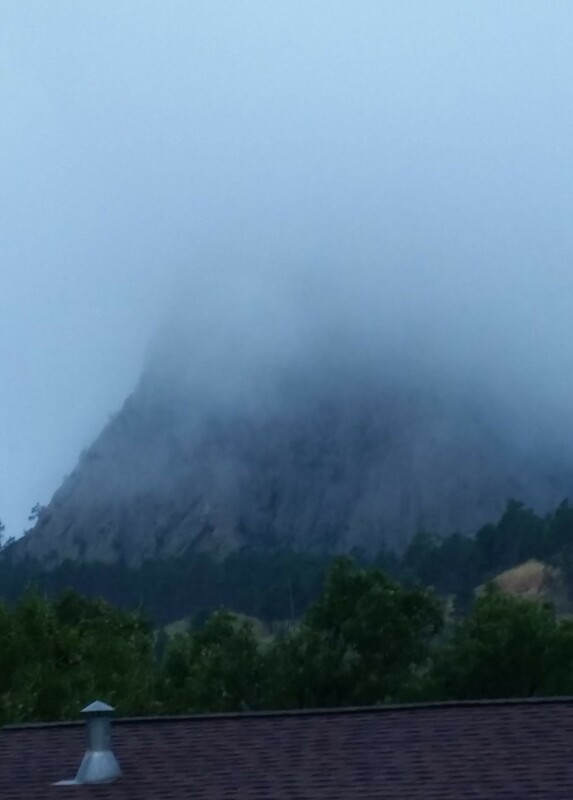 Devils Tower, shrouded in fog in the morning. 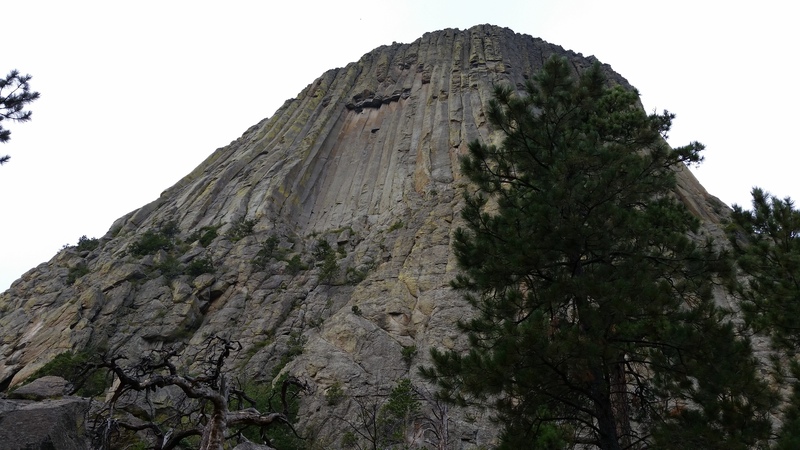 On Day 3 of our trip, we went to Devil’s Tower, and drove through Big Horn on our way to Yellowstone. I wasn’t really sure what to expect when it came to Devil’s Tower. After all, it was just a big rock formation, right? We saw it from our campground – cool. It was smaller than I expected from a distance. Even up close, it was only a 1.3 mile hike all around the base, though taller than it originally seemed. I fully expected all the kids to complain about having to walk around it; especially since it was drizzling when we got there, and covered in fog. 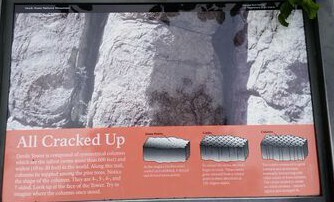 The sign that talked about how the Devils Tower rock formations were created. Instead, we all enjoyed the hike around the base. The fog quickly cleared. We saw rock climbers going up the tower, and coming down from the top. We saw some rocks that we got to climb on, beautiful overlooks, and learned a bit about how rock formations can be made. What was cool to read about, was how it started as solid magma, then tiny holes were formed as heat tried to escape. Eventually, the holes created cracks all the way down, which created columns in 4, 5, or 6 sided shapes. Did you know hexagons are nature’s most perfect fitting shape? Devil’s Tower after the fog cleared. There were several lookouts all around the tower. Some looked out over the valleys, some looked at forest or rock formations. We got some great pictures, learned a little, and had an enjoyable hike – the first of what would become many over the course of this trip. 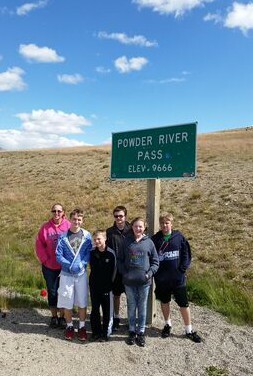 This may have been one of the highest altitude points of our trip… as you can see, not much grows up there! We stopped at a few of the scenic overlooks, for even more amazing views. At one point, we were at “the tree line.” Practically nothing grows at that altitude. When we got out to take pictures at the overlook, we were surprised at how cold and windy it was up there at close to 10,000 feet above sea level! One thing to note about Big Horn: USE THE RESTROOM BEFORE ENTERING THE PARK! I can’t emphasize this enough! We drove over 60 miles (at slow speeds due to being in the mountains) with people who had to pee, and there were no rest rooms or portapotties in sight! Being that we were in a National Forest, it felt a little wrong to just go pee in the woods! One of the coolest features of this leg of the drive, was in Buffalo Bill State Park, an area between Big Horn and Yellowstone. We drove through three tunnels that went right through the mountains. 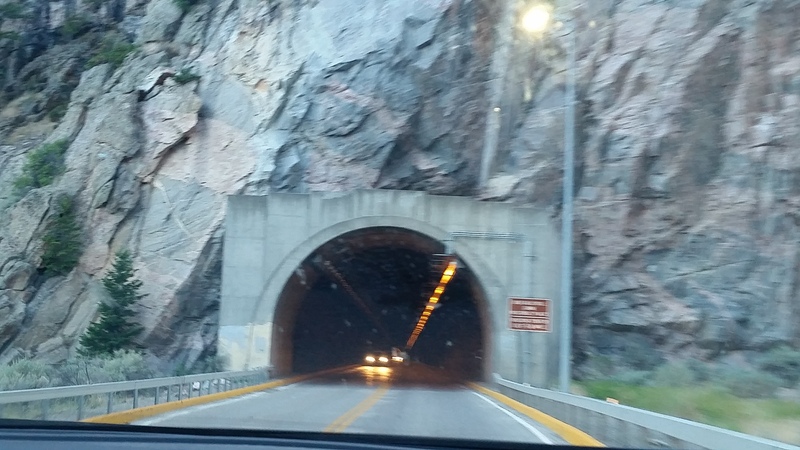 We have plenty of concrete tunnels here in MN, but there’s something really cool about driving through a tunnel, knowing you are in the middle of a mountain, and seeing nothing but stone around you. Grace was a little freaked out by the thought that the tunnels could collapse around us at any moment (though, we all know they wouldn’t). She held her breath through each one. The last tunnel was really long, I was a little afraid she might pass out if we didn’t get to the end soon. One of the tunnels going through the mountain in Buffalo Bill State Park. We pulled into Yellowstone after dark. We were almost immediately greeted by a HUGE porcupine in the road, that stared at us as if daring us to hit it. Seriously, I didn’t know porcupines could get that big. We didn’t hit it, we stopped and watched it for a minute as it gave us that daring stare, then went around it. We also saw an elk cross the road in front of us. Finally, we found our campground and started to set up. That night, we were FREEZING!! None of use expected it to get THAT cold during the night. We all shivered despite wearing layers, having sleeping bags and blankets. At the end of each day, I asked the kids what their favorite part of the day was. Their responses were varied. Dysin liked the Big Horn Mountains the best. Aspen liked almost hitting the porcupine. He was one of the only kids still awake at that point, so he actually got to see it. Grace and Nikolai both said their favorite part of the day was the hike around Devil’s Tower. Michael liked feeding the banana chips to the prairie dogs, and hiking at Devil’s Tower. He also was the only one that was warm that night. It was a great one of many days on our trip.